I yelled at my kids tonight. It started before the mouthwash spilled all over the floor, my jeans, and my new shirt. That I have an issue with anger and emotional control is not something I’ve kept secret. But it’s still painfully destructive in my own home: “The wisest of women builds her house, but folly with her own hands tears it down” (Proverbs 14:1). So when my blood pressure had returned to an appropriate range and I determined the mouthwash only minimally soaked my front, I called all of my kids to our little loveseat. Some of them crawled out of bed. They piled around me like puppies. And I took the time—again, like I have to do so often—to apologize to them and ask for forgiveness. Then, I led us in praying and repenting to God. It was duly needed for all of us. I thanked my kids for forgiving me—also not so bad a quality to practice—and ended with tickling them into screaming laughter. As I backed out of their room in the dark later, I yowled in pain after stepping on an electrical plug someone had left in the doorway. My second son was quick on the draw: “Still love me?” He collapsed in giggles. None of this, I’m afraid, undoes what I did. This content was taken from the participant manual for FamilyLife's Art of Parenting. 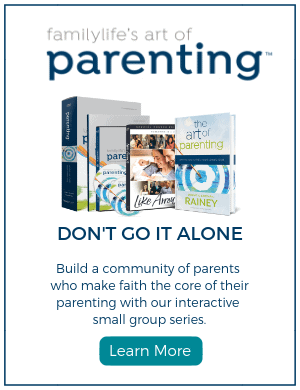 To learn more about the study and how you can start your own small group, please visit FamilyLife.com/Parenting. A family that practices repentance keep short accounts with each other, apologizing quickly and sincerely. The point of apologizing to my kids even when they’re in trouble isn’t at all to detract them from their sin. They need to grow up with my willing confession as the norm, to give them the knowledge that Mom requires a Savior as much as they do. 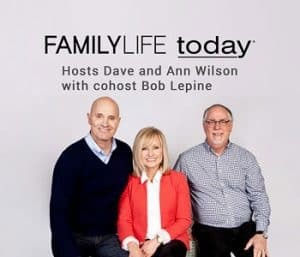 An awareness of the log in my eye—even when my children or spouse are the offenders—is biblically commanded (Matthew 7:1-5). I guess it can sound a little hokey when we’re not used to using such language in our homes, but that’s my point. Should it be? Call me an idealist, but I’d like this replication of Christ’s words to become the norm, a chance to apply the gospel to myself and to my loved ones daily.